On October 12, Golden Year 9 (2012), the European Union (EU) won the Nobel Peace Prize for its decades of work in promoting international harmony, democracy and human rights. A forerunner of the EU, The European Coal and Steel Community, was established in 1952. The EU was later created in 1957 by the Treaty of Rome. Since then, the organization has grown to include 27 nations extending from Russia to Ireland. Over the years it has helped rebuild Europe from the devastation of World War II, and bring peace and stability to the region after the fall of the Berlin Wall. It was with jubilation and admiration that the world receives the wonderful news that the European Union has been honoured with the 2012 Nobel Peace Prize. We would like to offer our heartfelt congratulations to this extraordinary organization. I wholeheartedly agree with The Norwegian Nobel Committee as no one deserves this prestigious Award more than the great European Union. For over six decades, the union and its forerunners have accomplished tremendous strides in its goals to promote peace and reconciliation, democracy, freedom, shared prosperity, and human rights, both in Europe and around the world. Thank you, European Union, for being a shining role model of how nations can work together to bring greater unity, peace, prosperity, and happiness in our world. We look forward to the many more noble and enlightened achievements to come. I hereby send my well wishes for the European Union and all its 27 members, and counting, as you continue to pave the way for more glorious and peaceful future for humanity. 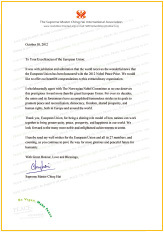 It is with the greatest admiration and immense gratitude that we present to the European Union the “Shining World Leadership Award.” This Award is presented in recognition of the Union’s unprecedented, historical endeavours towards the development of a unified, free and peaceful Europe and its outstanding influence as an exemplar for peace, democratization and human rights worldwide. 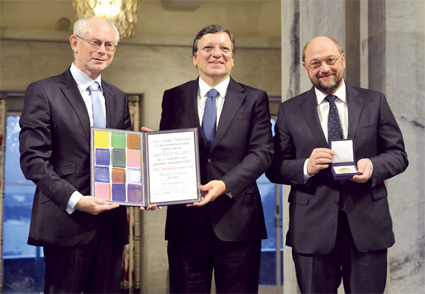 The Union’s extraordinary triumph of transforming Europe into a “continent of peace” with “fraternity between nations” has been recognized with the conferral of the 2012 Nobel Peace Prize. Hailed as the single greatest contributor to global peace since World War II, European integration has bequeathed an era of shared prosperity, stability, solidarity; an era of where conflict between neighbours is no longer an option. Increasingly influential in world affairs, the EU has advanced the establishment of universal rights and values, actively promoting the abolition of capital punishment internationally and enshrining freedoms by requiring compliance with its Charter of Fundamental Rights as a condition of membership. With open borders and a single currency, the citizens of Europe enjoy unparalleled freedom to live, work, and travel across this richly diverse community of nations. Now a family of 27 members, the Union continues to act as a harbinger of harmony and unification as it embraces the Balkan countries thus strengthening the reconciliation process in that region, continuing its vital role as peace-maker between East and West and serving as an exemplary model for how sovereign states can cooperate to forge a common destiny. For nurturing democracies and championing human rights, for being a force for peace on the global stage, and for ennobling and enlightening our world, we hereby applaud and celebrate the exceptional work, the inspirational leadership, and the shining moral strength and guidance of the European Union.